Property Info: 3BR, 2BA Property with approx. 1683 sq. 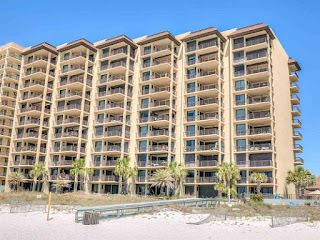 ft.
Orange Beach condominium for sale at Romar House. We dare to compare! Architectural digest would love how the owners have recreated this space. Indescribable elegant! Harmonious colors that truly reflect and accent the Emerald Coast and White Sands! ($150,000 renovation Spring of 2017 all the way to the studs- not including the lovely furnishings that are included. This complex has 2 beautiful pools, grass tennis courts, gym with sauna, clubhouse and covered assigned parking. This complex has onsite management and gated 24 hour security and is a non-rental unit.